There is perhaps no area of surgery where more serious mistakes are made than in open heart surgery. 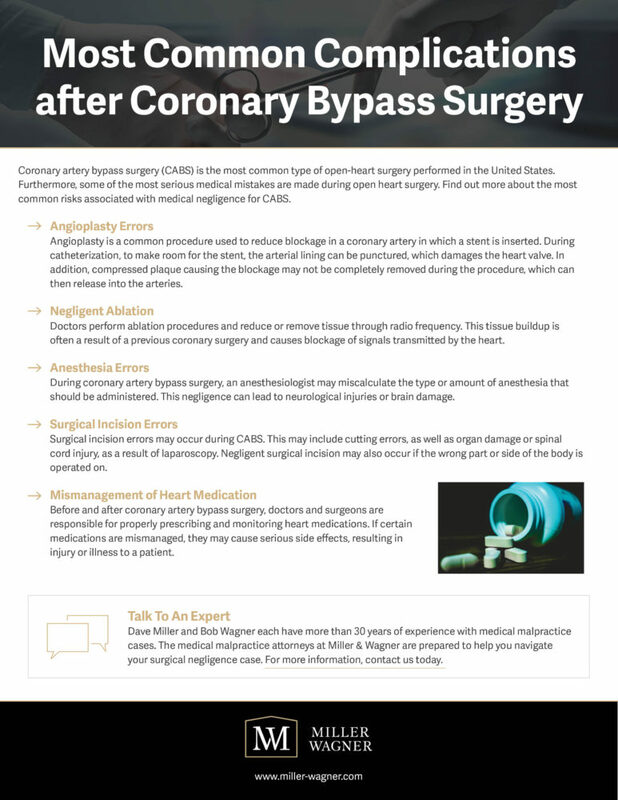 Coronary artery bypass surgeries are among the most common types of coronary surgeries and heart surgeons are among the most highly trained specialists. A mistaken diagnosis or misplaced cut near the heart can result in death or permanent heart damage. If someone in your family was injured or died as a result of a mistake made by a surgeon, anesthesiologist or operating room staff during coronary artery bypass or other open heart procedure, discuss your legal options with an experienced trial attorney. Medical negligence claims involving complex medical and technical issues involved in open heart surgery require extensive knowledge and experience. Dave Miller and Bob Wagner both began their legal careers as a defense lawyer for malpractice insurance companies. Their insights into the claim evaluation and investigation process from the defense side can give you an accurate idea of the strength and value of your case. They also have access to a wide network of outstanding medical experts — trusted professionals whose involvement with your case is indispensable to its success. In fact, Oregon and Washington doctors often call Miller & Wagner when they need advice about potential malpractice claims for their own family members and friends.